The media area at BT Murrayfield is named in honour of Bill McLaren and you couldn’t help but think on Saturday how much the great man would have loved watching the performance of Darcy Graham. The 21-year-old from Hawick, the beloved home town of the ‘Voice of Rugby’, was magnificent in a narrow losing cause as Edinburgh were just edged out in this titanic tussle with Munster in an enthralling Heineken Champions Cup quarter-final. Moved to the full-back position he played in his youth and club days, Graham was a “buzzbomb” of activity all afternoon, a veritable trout up a Border burn as he gave everything to try and breach what was, for the most part, an impregnable red wall of defiance from the two-time European champions. “We’re very frustrated. We were in it for the whole game and it just got away from us,” said Graham in the immediate aftermath of a 17-13 loss which was sealed by Keith Earls’ second try of the match in the last ten minutes. 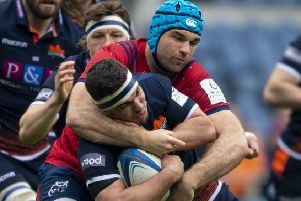 Chris Dean scored Edinburgh’s try in what was a ferociously fought contest, with a reversed penalty decision proving decisive near the end when prop Pierre Schoeman barged into Munster lock Tadgh Beirne. “These big games down to the fine margins, little details. We were fairly clinical for the whole game but fair play to Munster, you can’t take it away from them. Graham, and the rest of the Edinburgh players, could hold their heads up after giving their all in the quest to reach the semi-final stage of elite European competition for only the second time in Scottish pro-team history. Graham’s diminutive status is sometimes overplayed, he isn’t tiny, but still some way off some of the giants who roam modern-day rugby fields. However, what he lacks in bulk he makes up for in fleet-footedness, character and an ever-maturing rugby brain. He first burst on to the scene as a young full-back scoring a magnificent winning try for Scotland Under-20s against Australia in the junior World Cup but, after spells with the Sevens squad, wing has been his allotted position for club and country. 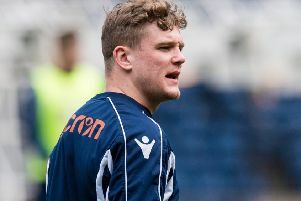 Graham said he still considers Blair Kinghorn, another youngster who can float around the back three but is currently out for the rest of the season with an ankle injury, as the man in possession of the Edinburgh No 15 jersey. “I enjoyed full-back. Roaming about the pitch, getting on the ball, that’s what I look for, popping up anywhere, going hunting for it,” said the Borderer. Edinburgh now refocus attention on the Guinness Pro14 and the push to get back in the play-offs and, perhaps more importantly, ensure that they are back in the Champions rather than Challenge Cup next season. “That is huge for us because this season has been great for us, playing in these big games,” added Graham. “They’re massive for us. 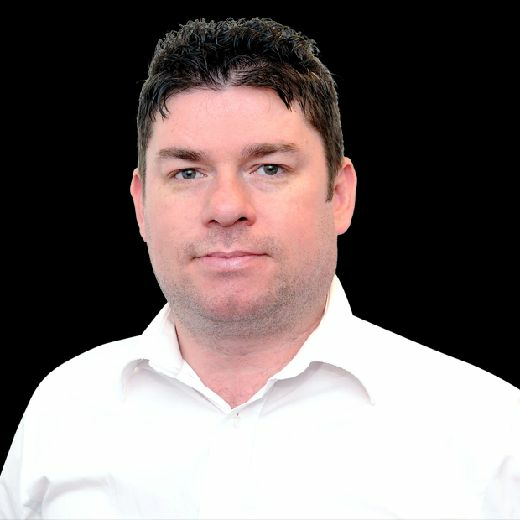 That job starts this Saturday with a tough trip to Scarlets and Cockerill didn’t take long in shaking off the Munster disappointment to look ahead to the season’s big finish. “What happens in the next three weeks will have an impact on what happens over the next 12 months.” he said. “We need to make sure that the next three games are solid and we try to get into the play-offs for the Pro14 and qualify for Champions Cup. “There’s no point in resting people for these three games. What are they resting for? The beach? Scottish players, these lads, are not a protected species. They need to learn to rock up week in, week out, look after themselves properly, prepare properly and play to win. “We did it last week [against Leinster] and we’ve got to do it again next week and the week after.